The History of "My So-Called Life"
Winnie Holzman joins the writers of the tv show "thirtysomething". "Fathers and Lovers", Winnie Holzman's first script for "30s" airs. Winnie Holzman writes fictional dairy entries for a teenage girl. (perhaps based on ideas from her 30s-epsidode "Melissa And Men") Her main workplace are coffee shops in San Fernando Valley. She gets a job helping a teacher in a local high school. The casting begins. One of the first auditions are: A.J.Langer for the role of Angela (she gets later the role of Rayanne, Angela's new best friend). A.J. didn't get the role at first, Devon Gummersall tells her a few days later to try it once again. Winnie Holzman finishes the final draft of the script for the first episode of "Someone Like Me", which was the first title for the series. The shooting for the pilot episode begins in Los Angeles. The show is scheduled to air in September 1993. ABC presents the new show on the annual winter press tour. Claire Danes and her family move temporialy to L.A. for the time of the shooting. One episode needs eight days to shoot. There's no slot for "My So-Called Life" in the spring lineup. 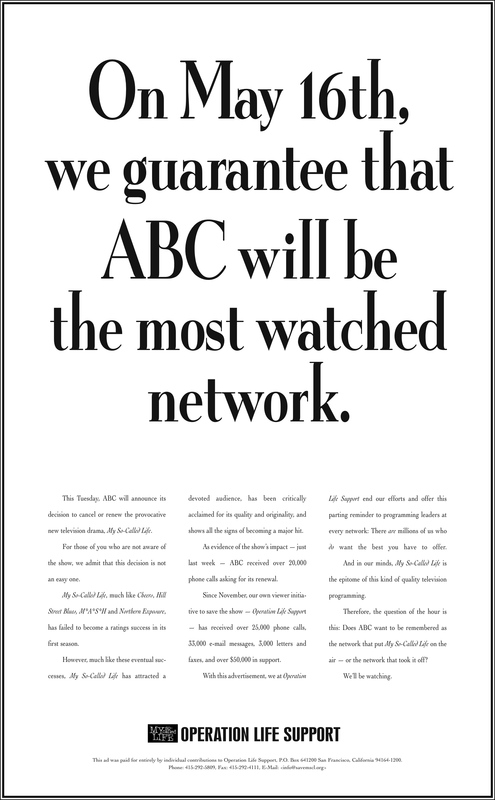 ABC orders six more episodes, bringing the total to 15 episodes. Claire Danes is so exhausted by the shooting that the production has to stop for four days at the end of spring '94. The episodes 1-8,10 have finished shooting. The production stops for several months. Note: Episode 10 ("Others Peoples Daughters") was shot before Episode 9 ("Halloween") ! The first episode of "My So-Called Life" airs on ABC ! Claire Danes attends a high school in Los Angeles in addition to on-set-teaching. Episode No.16 has finished shooting. "Operation Life Support" (OLS) is founded by Steve Joyner. The last episode has been shot. No one knows whether the show will be picked up for a second season. The last episode on ABC is over. 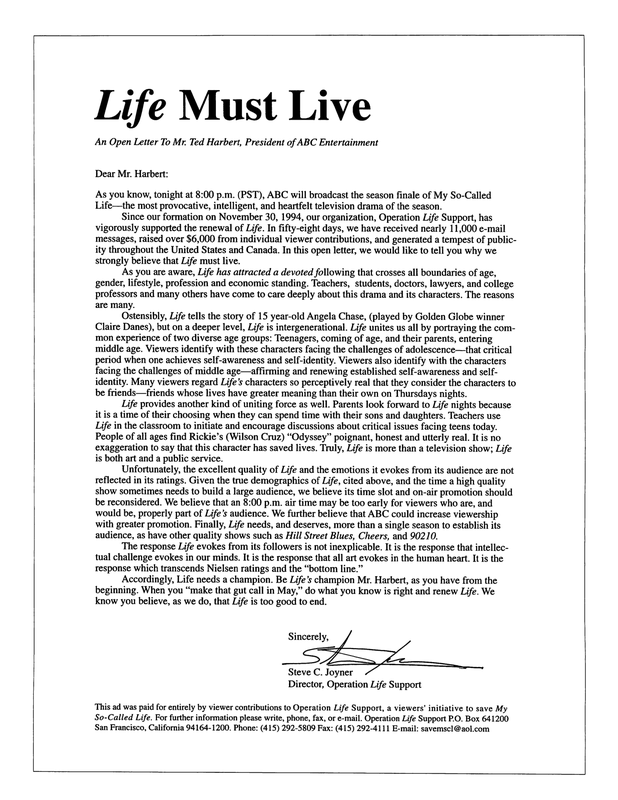 Operation Life Support places two "open letter" ads in "Daily Variety" and "The Hollywood Reporter." The Museum of Television & Radio in Los Angeles features MSCL: Creators, actors and fans come together for a celebration of MSCL. MTV buys the rights to air the 19 episodes of "My So-Called Life". They air it more than 3 years. 10:00 AM PT: ABC officially cancels "My So-Called Life". 12:09 PM PT: OLS publishes email "Danes Brings Death to 'Life'"
OLS runs full page ad in "USA Today." First scheduled Shipping/Publication date for "Fighting For Life" - The OLS Book. The release gets postponed. The first six episodes of "My So-Called Life" are available on video, published by Bugjuice Inc.
6 more episodes are released on video. Christine Clark publishes her follow-up book "My So Called Life Goes On". It's not an official continuation, but Winnie Holzman seems to know about it. BMG Video won't release the remaining 7 episodes on video: MSCL is canceled again. BMG Special Products / Bugjuice.com announce the release of the first three episodes of MSCL on DVD. Fox Family announces to re-air all episodes of MSCL. This would be the first airing of MSCL in three years in the US. The first three episodes of MSCL are available on DVD. They sell very badly. Jason Rosenfeld from BMG Special Products contacts MSCL.com and informs us about the slight possibility of a boxed set release of all MSCL episodes on DVD. MSCL.com launches an online petition for all episodes of "My So-Called Life" on DVD. More than 4,700 fans subscribe in the following months. MSCL.com goes public with the information about a pending DVD box set release by BMG Special Products. MSCL.com starts the so-called "pre-pre-order" list to show BMG the demand for the boxed set. Again, more than 4,500 fans leave their e-mail address. BMG SP is no longer interested in producing and selling the sets themselves. Another company decides to take the chance and orders 4,000 sets from BMG SP. The pre-ordering phase of the MSCL DVD box begins at anotheruniverse.com. The release of the so-called "exclusive" set is set for June 2002. AU receives more than 3600 orders in the following months. After a long wait and many ugly problems with AU, the first sets are finally shipped by AU and surprisingly much cheaper from other stores like amazon.com. Large quantities are also available at Best Buy stores. AU customers are still waiting for the so-called bonus disc and lunchbox. BMG Special Products is rumored to have produced alltogether more than 25,000 sets for various retailers, including AU. New editions of DVD sets are available in the UK, Germany and the US.